Why should you join VVR ? The nature of the civil services exam has underwent a sea change. It has began to focus, more upon the analytical and critical thinking ability in various area of the Main Exam viz., History, Polity, Economy and more so in the introduced GS Paper-IV, Ethics, Integrity and Aptitude. The traditional method of learning through monologue lectures has not proven its efficacy to cater to the real demands of the exam, i.e, the need to develop critical thinking ability upon various areas of the General Studies paper. VVR has endeavored to equip the aspirants with this skill so that the toughest questions of the exam is answered with confidence and ease. We appeal to the aspirants to attend our lectures and get a feel of our ethical intentions and capabilities of transforming your dreams of serving the nation though the coveted IAS, IPS, IFS Services(CSE) in to reality. Analytical and research based approach: VVR presents multilayered analytical and research based approach towards the exam. The thorough strategy of VVR focuses on analysis of each topic of the syllabus from different dimensions by the experts of different subjects. It brings a complete outlook of the topic with an in-depth coverage and interlinking of different subjects. It surely reduces the efforts of students given in self study and also the time spent in the exam hall for the analysis and interlinking of different topics into one. Highly Qualified and Trained Faculty: The faculty of VVR comes from the top most educational institutes of the country; they have a vast arena of teaching experience. Exhaustive, Relevant and Original Study Material and Test Papers: The study material and test papers are designed on the latest pattern of the exam by the conversant writers under the personal guidance of the experienced faculty and is reviewed by panel of experts comprised of bureaucrats and educationalist of premier education institutes of the country. Integrated approach of Teaching: We employ “Integrated Teaching Methodologies” in order to prepare the aspirants for all phases of exam simultaneously. This outstanding approach of training has borne splendid outcome. Advanced IPBP for cutting edge preparations: The programmes of VVR are based on the advanced idea of“lntegrated Psychological Buildup Programme (IPBP). It aims to bring parity among the students irrespective of their intelligence quotients. It not only equips the students with a psychological backup but also helps even the average students to emerge as toppers like the brilliant ones. It imparts quality education among the students in such a manner that they may have an edge over others.We believe in Mind training rather than cramming. Bilingual study Aids: We believe in providing the teaching in the easiest of the manner to the students. Hence classroom teaching programme by the faculty is based on such a mode which is effortless to understand. Even the study material is provided in both English and Hindi Mediums whenever it is required by the students. Special Revision Classes: These classes serve as start engine for non-serious and shy students just before the exam. During these classes special attention is given to the students for their revision and for raising doubts that they come across during their studies. This special session boosts the confidence, enhancing the knowledge quotient of even average students parallel to that of toppers and also motivates them to perform like the toppers. 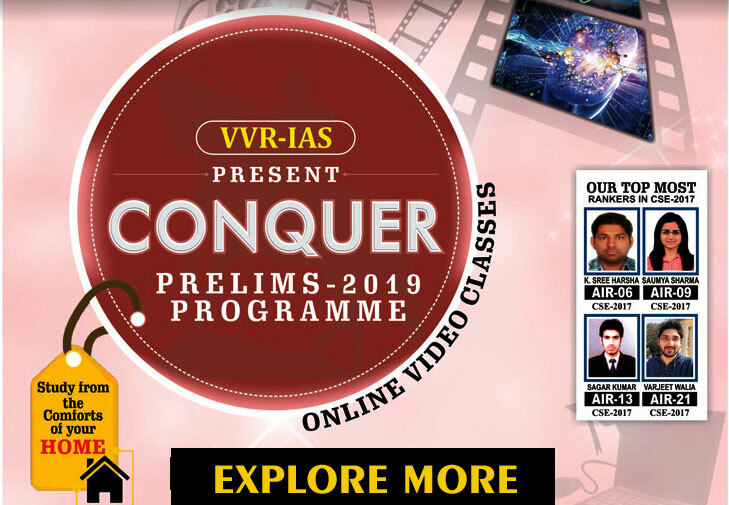 Compensatory/Backup Classes: If a student misses out certain chapter or a particular class, we at VVR ensure that he/ she does not drag in the next lecture hence, we provide him/her the opportunity to attend the video lecture of the same so that he/she may ride parallel to others. Competitive Environment at VVR motivate the students for determined learning resulting into majestic accomplishments. Innovative initiatives: We believe in bringing best for our students, hence we always try to bring innovative ideas to help our students. The special programmes comprising special writing skill enhancement programmes, mind training sessions, online test series programme, attendance reporting and test score detailing, audio video interactive and animated classes etc are also conducted for better clarity of students.